Rod and I have released our first children's book featuring the adventures of Hickory, an inquisitive little hippo, and his animal friends. This has been a long time coming, and we're excited to finally be able to introduce it to the world! The first adventure, Hickory Hippo and the Snow Mystery, is available right now in time to be a holiday gift for any little ones, friends or family in your life. Please check out our cute little project and consider sharing or ordering Hickory Hippo and the Snow Mystery. It can be purchased through Amazon.com or HickoryHippo.com. We appreciate all the support we can get! Favourite genre of music: Rock, Industrial, Rock 'n Roll. 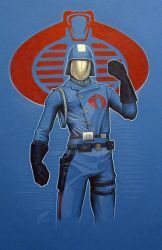 Favourite cartoon character: Cobra Commander, probably. Personal Quote: "If your mind isn't open, keep your mouth shut too." Favorite visual artist Mike Wieringo, Wendy Pini, Brian Bolland, Andrew Loomis, various Renaissance artists Favorite movies Silence of the Lambs. Favorite bands / musical artists The Beatles, Queen, Rammstein, Nirvana, Tadpole, Nightwish, Rob Zombie and a bunch of others. Tools of the Trade Mechanical and regular pencils, inks, Prismacolor markers, intuos tablet, Photoshop and Illustrator. Other Interests Comic books, history, classic British sci-fi, animation, movies, music, anime, art. Keep up the truly fantastic work! May the Force be with you! Additional Note: When you artists made the Tardis appear in the Return of the Jedi arc, and William Hartnel walked out in panel, me and every fan with good taste could not quiet down our cheering! It's your Birthday here now so start the celebration whenever you feel like it. Have a very Happy one Leanne and hope the cake is delicious and moist.